The motor skills (see full Glossary) of a child 10 to 12 years of age are developing and getting refined quite nicely. They have good balance and are quite coordinated. 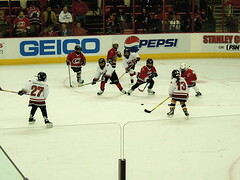 engage in complex sports such as hockey (Fig. 3) and soccer. tie knots and secure bows. Children at this age have a lot of energy. Getting them gifts that would allow them to use this energy is highly recommended.